This is hard to tell what's going on from this blurry image so I've also included a computer generated image with the hot areas high-lighted. I have now successfully located where the short is by cutting a few traces (I got it wrong the first time, got it right the second time). Can you do better than I and figure out where the short is without "cutting any traces"? Hint, the area that is getting hot is supposed to be just VCC (without a connection to ground). 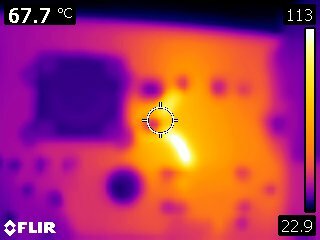 Hint #2, the voltage had dropped substantially on the resistor pad just above the letter 'C' (in CPC1008N) and had dropped to almost 0 on the pad below the 'O' in DIAGNOSE. 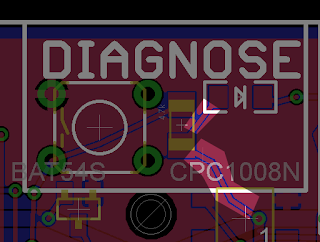 I would guess the ground plane is shorted to VCC beneath the "O" in diagnose, or else the diode has failed. What value did you use for ground plane isolation in Eagle? It looks like the isolation is only about 1/4 of the width of your smallest traces. That would make me kind of nervous - risk of unintended shorts between neighboring traces and the ground plane due to imprecision in the PCB manufacturing. Steve, you are correct. And in hindsight, I should've realized this also. The fact that I read a near 0 voltage on the pad near the 'O' in diagnose should've told me that that was where the short was. But I saw nothing visually touching, and my need to know for sure prompted me to start cutting. Now I have to wonder if I had just used a knife to cut around the pad if I could've fixed it that way instead of having a hacked board that I will have to sell at a discount. As for the clearance, I used values that the pcb manufacturer said were valid (4pcb.com). I've had over 500 boards made and this is the first one that has had a short in the PCB itself. So pretty good track record.